Our Shoulder bags are made for casual/fashion use and should not be overloaded. 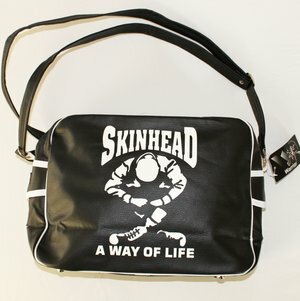 Made from a good quality PVC this Black Bag has a classic Skinhead print on both sides. Inside the bag is fully lined and has a zip up pocket. The bag has an adjustable shoulder strap and measures 35cm x 25cm x 9cm.